Following the “deadline” for resettling Narmada dam oustees, July 31, nearing, anti-dam oustees, backed by the Narmada Bachao Andolan (NBA), have threatened to begin an indefinite collective fast on July 27 till their demand not to be uprooted from their houses is fulfilled. The fast will be led by NBA leader Medha Patkar. The indefinite fast action will follow the relay fast, currently going on at 21 different spots in Madhya Pradesh for the last 17 days. The July 31 deadline is based on a Supreme Court order dated February 2, asking the Madhya Pradesh to complete the resettlement of all oustees by July-end, so that Gujarat could take advantage of the dam’s FRL. Explaining the need for intensifying the protest act, NBA said in a communiqué that the rehabilitation sites are still not ready for the oustees, yet the dam’s height is sought to be taken to the full reservoir level (FRL), 138.64 metres, from 121.92 metres, as part of the “political game” in Gujarat ahead of the state polls in December 2017. 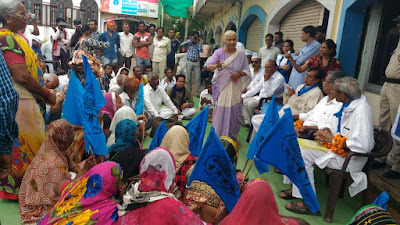 The decision to go in for indefinite fast has been taken even as the Madhya Pradesh police stepping up its campaign, asking the Narmada dam oustees to vacate villages situated next to the river, as with the closure of the gates during monsoon would massively submerge a large number of villages. In Badwani town, situated next to the Narmada river off Gujarat border, the cops with guns in their hands, undertook mock drill, asking oustees to immediately vacate their villages on or before July 31. Massive rains generally take place in Narmada catchment areas in August-September, and waters rise by several metres every 10 to 20 days, and this said lead to a dangerous situation by October for those living next to the river. The Madhya Pradesh government has officially admitted, through a notification dated May 25, that 18,386 families 141 villages would have to “leave” houses by July 31. Disagreeing, NBA says, nearly 40,000 families of 192 villages and one town would be affected. 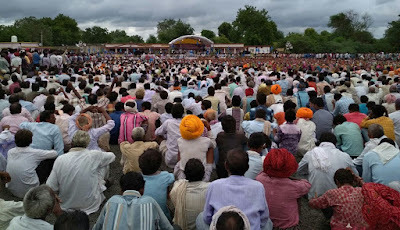 The decision of indefinite follows fast follows massive support in Badwani district to NBA on July 22, where leaders of several political parties, including Congress, Communist party, Janata Dal (United) and Aam Aadmi Party, interacted with the oustees. Around 50,000 people are claimed to have spontaneously gathered for the NBA’s show of strength. Meanwhile, in a statement, Communist Party of India general secretary Sudhakar Reddy has said that the February 2 Supreme Court order clearly talks of "complete rehabilitation" Narmada dam oustees before evicting them, underling, the Madhya Pradesh government is "violating" the order,putting at risk 40,000 oustees.